StockTwits is a stock market information platform similar to Twitter that allows you to follow companies and stocks, conduct searches, connect with investors, and watch trending topics. The platform’s free analytics and sentiment tools make it more effective than Twitter for following the market. Follow users: As with Twitter, you can create a list of users to follow. Be aware of spammers who post simply to generate hits to their websites — they should be easy to identify as you become familiar with the platform. Follow stock tickers: The novelty of StockTwits is the ease with which you can follow stocks. Once you find a ticker of interest, simply click follow. Once you’ve begun following a ticker, any post related to that stock will appear in your home stream. Use CashTags: These are akin to Twitter’s hashtags. Instead of using a # symbol, add a $ symbol before any stock ticker in order to categorize and tag that post. Discover what’s trending in the markets: Under StockTwit’s trending feed, stocks are organized by the volume of messages cash-tagged with a particular ticker. Leverage StockTwits Signals: Signals are the free analytic and sentiment tools that greatly distinguish this platform from Twitter. 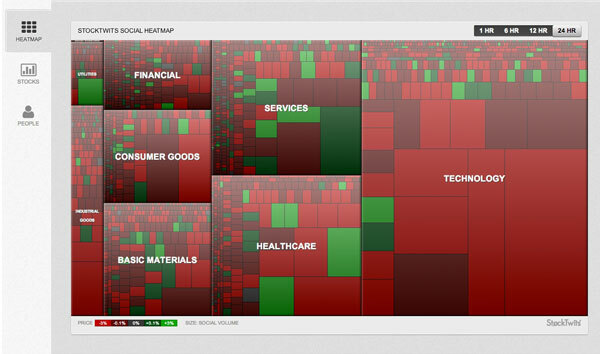 Social Heatmap: Shows every stock mentioned on StockTwits in one graph organized by sector, message volume, and price variation. The size of each box indicates the message volume for the stock while the color and brightness indicate the direction and price variation. 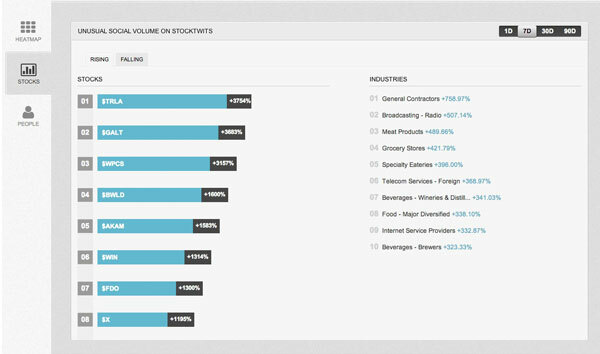 Unusual social volume: Features the most volatile stocks based on mentions on the StockTwits platform. You can learn more about StockTwits online, or download the app on iTunes for Apple devices or on Google Play for Android.